After a long silence, I've come back to posting. Being a Victorian in heart and soul, I have no computer at home. Last autumn, I was SHOCKED to discover that my workplace had blocked several sites, including YouTube, Pandora, and Blogspot. Judging from my officemates, though, you still can hit eBay, JibJab, and Rush Limbaugh. But I have discovered a local library with more computer spots than users to fill them, so I gathered up some period photographs to illustrate how graceful Victorian women held their arms. Even more than dress and speech, bodily deportment, especially the arms, was a mark of a "true lady." This first photo is from a reenactment group which creates tableaux vivants -- a pastime popular well into the 20th century, until motion pictures killed off the taste. To me, this photograph illustrates how posture and carriage are integral to proper atmosphere. This group put a lot of work into clothing, props, research -- but looking at how they carry their bodies, I can't imagine them to be anything but modern individuals. I will not focus on the gentlemen, except to notice their hunching positions. The lady is grinning -- showing her teeth! a no!no! -- her head is not held by the neck, but seems to be slapped on the shoulders; her elbows are held awkwardly, too far away from the body; and there is no continous line following from neck down through shoulders to wrist. Deportment manuals compare graceful arms to the movement of a willow wand. 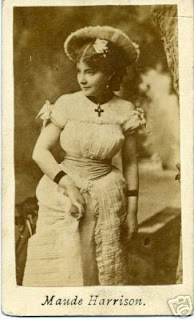 This CDV is of an actress playing Josephine in HMS Pinafore. I chose this to show a graceful extension of the arm. Josephine is pointing to something. Please note, actors, that pointing with a finger in the 19th century is rarely done. Objects, and sometimes people, were indicated with a motion of the eyes or with the whole hand. Pointing directly was used derogatorily, in accusation generally ("This is the culprit!"). Notice the "S" curve of the pointing arm, the slightly flexed wrist, and the sloping shoulders. The opposite arm balances the body and is also flexed into the "line of beauty". Here the actress Maude Harrison incorporates sinuous curves throughout her posture. Her head faces in the opposite direction to her body (common stage practice);her weight is on one leg, her arms are curved, and her right palm is turned away from the body to accentuate the "S". Because of this turning out, her right elbow is further out from her body than one usually sees. She does this gracefully -- a general rule for acting and re-enacting women is to keep the elbows close in to the body: this helps control the line from shoulders through the arm and concentrates energy in the body. Here is a lovely, lovely CDV of actress Mary Scott Siddons (great-niece of Sarah Siddons). The charm of this photograph owes a great deal to the carriage of the actress. Note all the "S" curves held in her body. Because of the heavy skirts and drapery, the position of her limbs and spine are even more important to an attractive stance. Another charming pose by an actress: the arms cannot always be held in curves, but holding them in graceful repose, keeping an "S" in head, neck and back, and holding weight on one leg, keeps an artistic and period presentation. This line drawing is an illustration from a book of directions for tableaux vivants. The lady on the platter, representing Faith, is pointing upwards. She is not pointing with a straight or tense arm, but the effect is still emphatic and draws the eye upward. The line of the arm echoes the line of the body and the drapery. The women supporting her have their heads gently inclined to make a curved line. The lady here shown is representing "quietude" in a drawing from an acting manual of the early 19th century. She also must extend her arms, but she keeps them close to her body and keeps a slight curve at elbow and wrist. Below I'm including two photographs from the mid 1860s to show exceptions to the rule. The first is of two actresses -- you can sense the tension between the characters, and if you analyse the photo you can see that much of this tension comes from the sharp angled elbows and shoulders. The second is a family photograph of two sisters (Victorian sisters usually dressed alike, until marriage). I do not know the particular reason for their posture -- holding the arms and hands at the waist is a common pose -- but these women seem very tense! I assume they're showing off their expensive lace mitts? Or maybe they're very nervous about being photographed? At any rate, the extraordinariness of this pose demonstrates how much we depend on a "feminine", soft and curving line for women's deportment. On the stage, departing from such lines should be done only to make a point of the character's emotion or social class. Actors should always be conscious of how close or far to the Victorian norm they are presenting themselves. What a wonderful collection of photographs! I see you're keeping up your old interests. Way to go. Hello, Rimi! So glad to hear from you after all these years, and thank you for complimenting my photos.